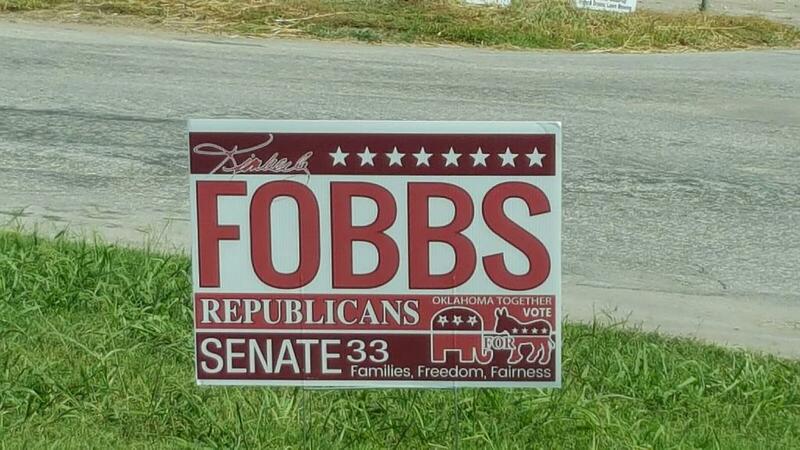 It appears that State Senate candidate Kimberly Fobbs is attempting to fool voters in Senate District 33 by using signs like pictured above. 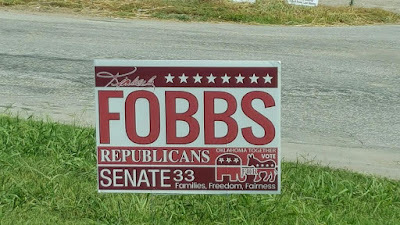 Some voters will probably assume that Fobbs is a Republican. That's not the case; she's a proud Democrat, and is running against incumbent Republican State Sen. Nathan Dahm. In the 6th most Republican district (59.29% Republican to 27.82% Democrat), it's not surprising that Democrats would try this. It reminds me of the fake Janet Barresi signs Democrats used in 2014. 2,187 Democrats voted in their two-way SD33 primary, while 6,259 voted in the three-way GOP primary, with Dahm receiving 3,994 votes (63.81%). Things don't look that promising for Fobbs. Kimberly Fobbs' explanation is so laughable! It reminds me of a boy caught in the girls locker room; then explaining that it's okay for him to identify as a girl because he claims there are a few girls who like him. Kimberly Fobbs should have PROUDLY given them a yard sign that clearly showed her political party! If the teachers supporting her can't plant a sign that is truthful, that clearly shows they are willing to be deceived and to deceive! Our FB page has this discussion topic frequently and the Republicans who asked for the signs have identified themselves in the conversation. I hope to serve and need no deception because I choose to help all families. Ted Cruz: "I will vote for Donald Trump"